The wonderful houndstooth paper is another design from the Festival of Prints designer stack which is exactly the right size for making these boxes! I loved the contrast of Cherry Cobbler with the bold print and softened the look with Crumb Cake seam binding. 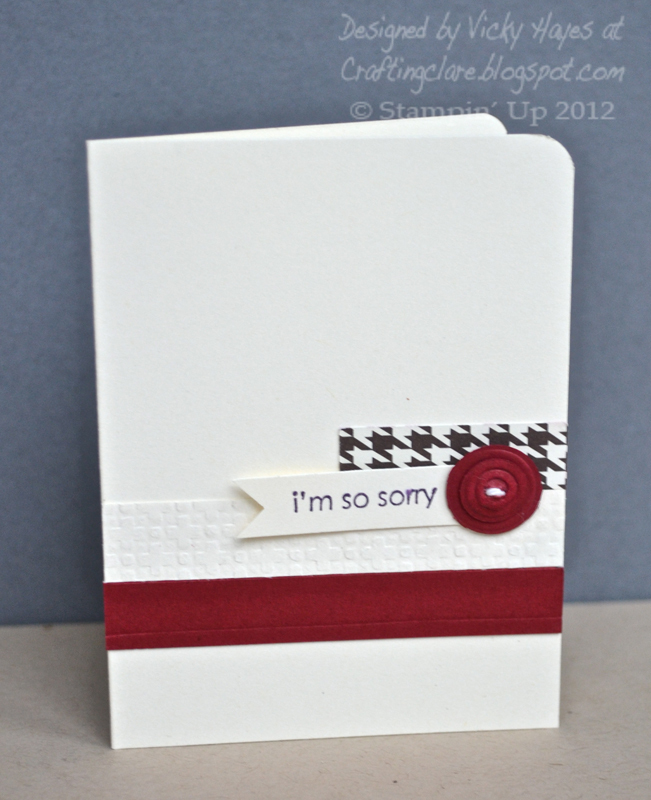 The tag is another one from the hostess set Mixed Medley - this really is a versatile set. I made a coordinating card - a really simple design with strips of textured and patterned papers and a gorgeous layered die-cut button. I'll definitely be using this design again. Here's a close-up showing the sentiment from Teeny Tiny Wishes - it seems to have got smudged. I'd like to say it was from my tears of sorrow but I don't think I'm going to convince you on that one! Talking of tears, I came into the living room yesterday to find my daughter rolling about laughing. When I asked what was up she told me she'd just read this: 'Everyone was crying at the wedding - even the cake was in tiers'. Hmm, it seems that hysteria has set in. Well it's Friday and it's a bit of a party weekend for me! I just hope I'm up to it... staying up until 10pm is a bit of a challenge for me these days - and will they be serving horlicks at a party do you think?! I hope you have a lovely weekend, whatever you're up to, and I shall see you very soon. 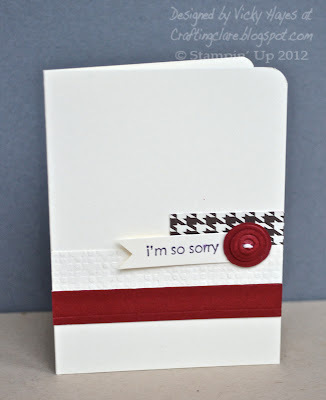 I love that houndstooth paper .. . very striking and great teamed up with that deep red. Your petal boxes are fabby too. I am not surprised you love making them. I hope all your Christmas preparations are coming along nicely. These are lovely, gorgeous dsp/colour combination. Oh WOW just brilliant and gorgeous. Not boring me at all . .. I adore these petal boxes and I love the matching card you've made. Sniggered at your daughter's joke! I am loving your little boxes. This one with the combination of houndstoothe and red is really elegant. Neat idea uising the "buttons"
The houndstooth looks brilliant with the red accent! I can't decide between the darling box or the awesome card!